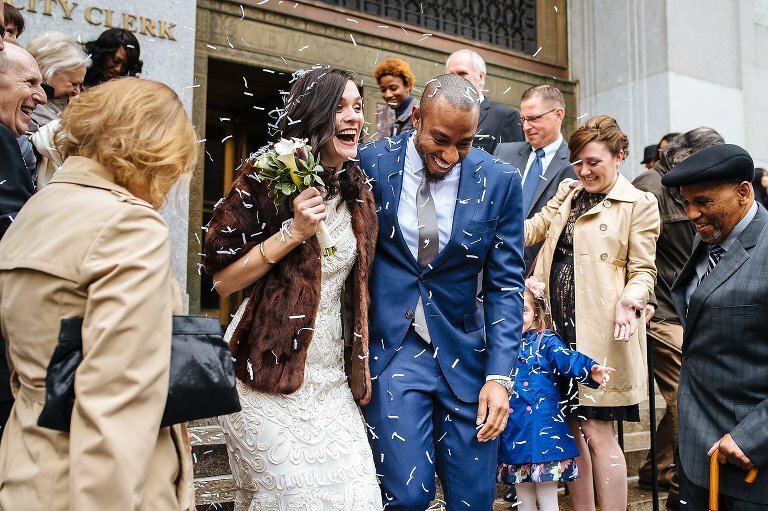 City Hall weddings in NYC are a uniquely great way to get married. A simple ceremony where all the logistics are handled for you, and you’re done in around 1 hour! 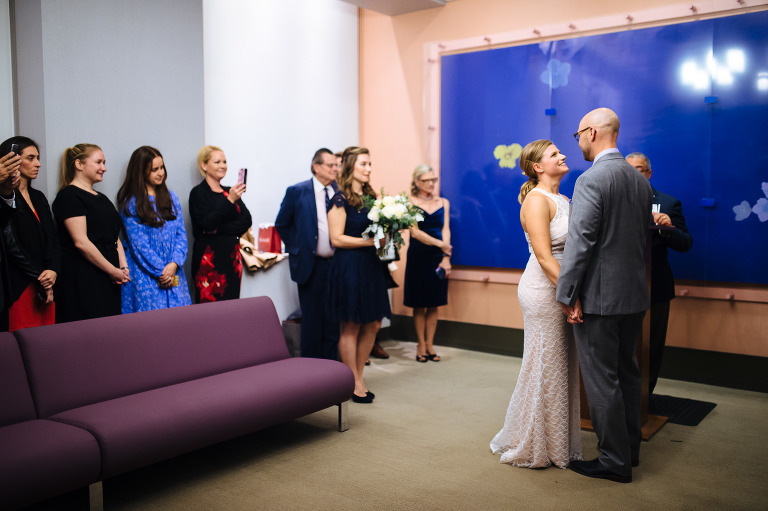 The City Clerk’s office, located at 141 Worth St, is what everyone is referring to when they say “City Hall.” It’s a pleasant government office where couples from all over the world come to get married. Over the past 7 years I’ve been in and out of City Hall hundreds of times as an elopement photographer. Getting married at City Hall does have a few pitfalls to be aware of, but is otherwise a great option for your wedding ceremony if you’re looking to keep things simple. And after walking out of the doors as a married couple, you can still sit down to an amazing elopement reception at a local restaurant or head to a classy bar for an after party with your guests! At least 24 hours before going to City Hall to get married, you’ll need to obtain your marriage license. 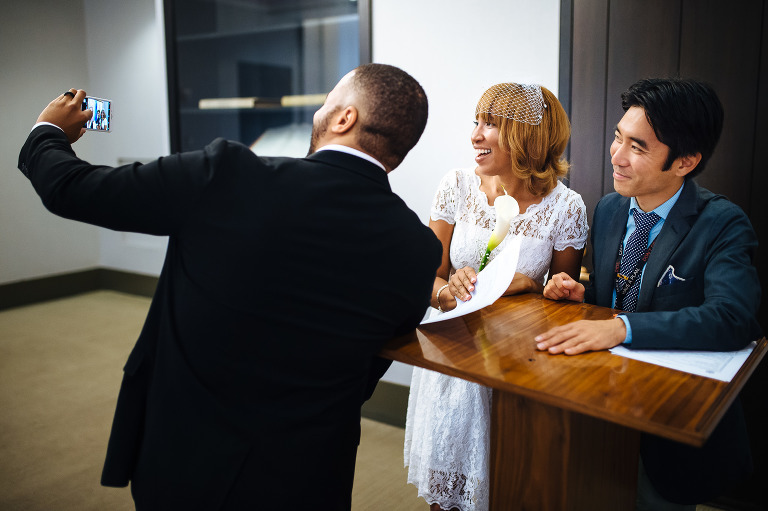 See our essential guide to eloping in NYC for detailed steps on obtaining the paperwork. Basically you’ll go into the same office the day before, or earlier, to complete this step. What’s the general process to get married at City Hall? When you arrive you’ll go through a security checkpoint, show your IDs and license paperwork to the clerk, and receive a number. Your number will be called up once to sign the paperwork (including your witnesses) and pay the $25 ceremony fee, and then you’ll be called up again to go in for the ceremony. It’s important to note that you cannot customize your ceremony at all; everyone gets the same standard vows and the ceremony itself lasts a brief 2 minutes. From the time you walk in to the time you walk out, the entire process takes an average of one hour and 15 minutes. Wait times can be longer in the Summer, on Friday afternoons, or around any holidays or significant dates (7/7/17, etc). On the best days we can be in-and-out in 45 minutes. When should we arrive to minimize the wait time? Because there are no reservations to get married at City Hall, aiming for the least busy times can help minimize the wait as much as possible. The marriage bureau is open from 8:30a-3:45p Monday to Friday. Generally speaking the best times to go are before 11a or around mid-afternoon. There’s definitely a lunch time rush, plus the staff rotates out so it goes a little slower until they catch up by mid-afternoon. The bureau closes at 3:45p, but this just means you have to be in the door and past the front desk by that time. As long as you’ve received a number to wait in line, they will get to you. I’m not aware of any strict guest limit imposed by the bureau, but the waiting area can get crowded on busy days and the ceremony spaces are not large rooms. I’ve had a group of 20 people go through with no problems; if you’re expecting closer to 30 guests I would suggest making alternate plans. Do we have to bring a witness? Only one witness is required, but you can have up to two. If you are bringing guests, one or two of them can serve as your witnesses. If you won’t have any guests you have two options — ask your photographer or grab another couple nearby. Your witness(es) must be over 18 and have valid photo ID. Besides signing your license paperwork, your witnesses will also need to be in the ceremony room with you. One of the officiants with the marriage bureau will perform your ceremony. They have a few in rotation and the most well-known is James Mitchell (before I knew his name, I just referred to him as “that mustache guy” and everyone knew who I meant). They’re all great and do their best to make a 2 minute ceremony feel as warm and personal as possible. Any other advice for couples looking to get married at City Hall? Enjoy yourselves! Your experience at City Hall is what you make of it. Use the wait time to people watch, chat with your guests, or just to reflect on the occasion with your soon-to-be spouse. If you’re getting married in the Summer, bring a bottle of water. While there are restrooms inside, there are no water fountains. A security checkpoint was installed last year and this has changed a few things. Photos are no longer allowed at the front desk area by the checkpoint. I can start photography inside once we’re past the front desk with a number in our hands. Everyone has to go through security, so if you’ll be arriving with a large group it can take a little time for everyone to get inside. It’s no longer practical to hop outside for some portraits if the wait is taking a long time. Once we’re inside it’s best not to leave until we’re done. Keeping it simple? Get married at City Hall. 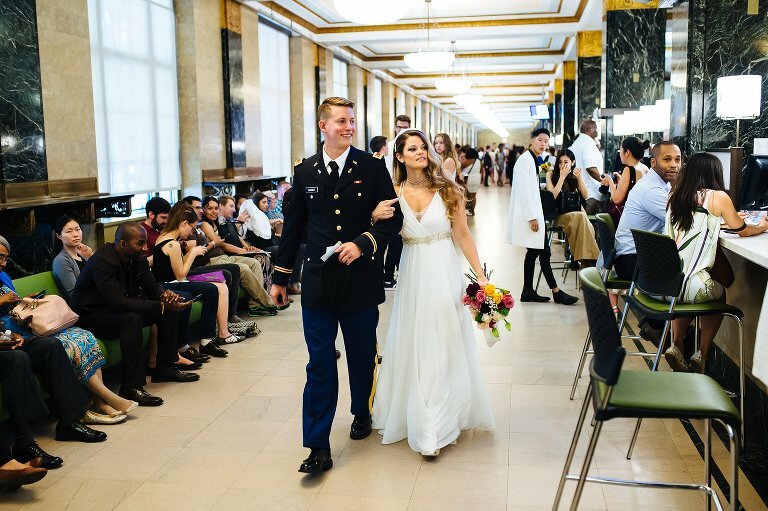 Planning a City Hall wedding? Get in touch today about preserving your intimate wedding day in beautiful photos! Alex and Lew eloped on December 2nd, with a ceremony at the Manhattan Marriage Bureau and a reception at the Cornell Club. These two met while they were playing softball in a sober tournament. They had coffee at 10 a.m. on a Sunday morning because Alex couldn’t schedule another time for him, but Lew still asked her for a second date in the middle of that coffee date—and she simply couldn’t turn down that kind of confidence. Lew proposed last June on the Empire State Building. Even though Alex knew it was coming, she didn’t try to look any different as they headed out together, walking around and looking for a good place for a photo before they settled on the northwest corner. When she turned around to take the photo, he was down on one knee. Now, while Alex works in e-commerce for fitness and other consumer products and Lew works as a drug rehab counselor, both of them are hoping to move into marketing. They love the people they work with, but want to move on to bigger and better things. The bride and groom have supported each other through their search for more meaningful careers. But while they are still working on changes in their careers, the change in their marital status went off wonderfully! Six months after their engagement, these two decided to elope, and I was honored to be there for this new adventure for the two of them. I especially loved the moment when they walked out of City Hall into an explosion of confetti. The look on their faces was priceless. We went out to the city for a few more photos after that and even stopped by Grand Central Station. The photograph of the two of them standing together, clearly wrapped up in nothing but each other while the hustle and bustle of New York carries on around them, is truly remarkable. Lew & Alex, thank you for letting me be part of this new and exciting chapter in your lives. I wish you both the best of luck as you find new changes and new adventures together.